Free Play Star Trek Against All Odds Pokies Slots. 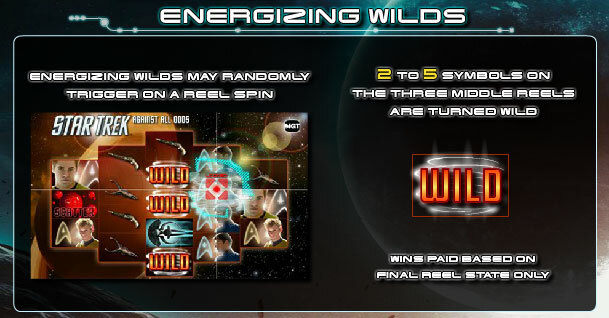 Based on the popular TV and movies series, Star Trek Against All Odds is a video pokie game from IGT that presents players with a five reel layout and 720 ways to win. This game offers epic graphics and amazing sound effects, many of which are directly from the movie. Fans of Star Trek will not be disappointed with the action of this online IGT slot as they will have the chance to win a base game jackpot of 1000 coins and a maximum game payout of $250,000. This feature rich game delivers one of the best pokie experiences that can be found with any IGT game. Have a FREE Spin right below – Warp Speed to your Wins! The graphics that are used in the game are stellar and players will see all the popular characters from the 2009 film. In addition, there are themed symbols on the reels as well as special symbols to trigger the bonus and represent scatters and wilds. All of the symbols are realistic and appear in 3D, offering one of the best visual gaming experiences to players. The symbols include Kirk, Spock, laser guns, Romulan ship, various weapons and much more. This game is available in a free version, but most players will want to win real money from their spins. The bets that are supported range from $0.01 to $5 and each spin will require a 60 credit bet to enable the 720 ways to win. The maximum bet supported is $300 per spin. The game does not have a huge paying base game jackpot, just offering 1000 coins, but with the bonus round it is possible to collect as much as $250,000 from this game. The main bonus feature in the game is the Enterprise Defender Bonus. This is triggered with five bonus symbols and players will then enjoy an arcade style bonus where they will defend the Enterprise from middles for a 45 second bonus round. Just use the cursor to aim weapons to destroy any incoming bombs and missiles and points will be awarded. Players will win 500 points for every missile destroyed and 100 for every bomb. If players get more than 12,000 points, they become Commander and with 14,000 points, hey become Captain. There will then be wheels on the screen that will spin and the higher the rank of the player, the better the bonus payouts. The bonus can offer payouts as high as 22,500x the bet amount. Star Trek Against All Odds may be one of the best movie themed games from IGT. The game graphics are astounding and the sound effects bring this game to life which will appeal to any trekkie fan. The bonus round in the game is a sill bonus, where players actually have a role in the outcome. This pokie delivers everything any player could want in a game and it can be played instant play right from our site FREE today. Join DR Spock, Scotty, Captain Kirk and all the crew on the Enterprise for some Final Frontier excitement in their efforts to stop the Romulan space ship! Google + Profile: Tina Lim on April 9, 2015. on April 14, 2015.